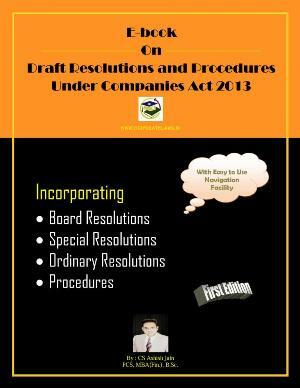 As per the provisions of Section 160(1) of Companies Act, 2013 A person who is not a retiring director in terms of section 152 shall, subject to the provisions of this Act, be eligible for appointment to the office of a director at any general meeting, if he, or some member intending to propose him as a director, has, not less than fourteen days before the meeting, left at the registered office of the company, a notice in writing under his hand signifying his candidature as a director or, as the case may be, the intention of such member to propose him as a candidate for that office, along with the deposit of one lakh rupees or such higher amount as may be prescribed which shall be refunded to such person or, as the case may be, to the member, if the person proposed gets elected as a director or gets more than twenty-five percent of total valid votes cast either on show of hands or on poll on such resolution. 1. 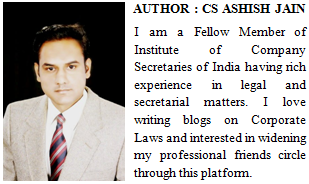 The candidate for directorship or any member proposing other person for appointment to office of director, is required to give a notice in writing not less than fourteen days before the meeting at the office of the company, signifying candidature for the office of director or intention to propose other person as a candidate for that office, as the case may be, along with a deposit of one lakh rupees which shall be refunded to such person, or as the case may be, to such member, if the person proposed gets elected as a director or gets more than twenty-five percent of total valid votes cast either on show of hands or on poll on such resolution. 2. 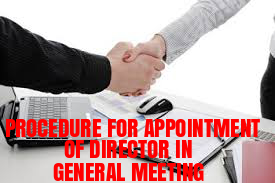 On receipt of notice, the company will inform its members of the candidature of a person for the office of director or intention of the member to propose such person as candidate for that office by serving individual notice on the members, not less than seven days before the meeting. 3. Where individual notice is not practicable, publish notice not less than seven days before the meeting, in at least two newspapers (one in English and the other in regional language) circulating in the place where the registered office of the company is situated. 4. In case of listed company, forward copies of this notice also to the stock exchange, where the shares of the company are listed. 5. Check whether the director to be appointed in the general meeting has obtained Director Identification Number (DIN). If not then ask such person to make application to Central Government for obtaining DIN and ensure that the Director has intimated his Director Identification Number to the Company. 6. Ensure that the consent of the director as well as the declaration from the director has been obtained in Form DIR2. 7. At the general meeting, the motion to appoint a person other than the retiring director will be taken up. 8. In case of listed company, send three copies of the notice and a copy of the proceedings of the general meeting to the stock exchange with which the company is listed. 9. In case the person is appointed as a director, the company shall refund the deposit of one lakh rupees to such person or to such other member, who had proposed his name for directorship. 10. The company has to file particulars of director in Form DIR – 12 with the Registrar of Companies within thirty days of the appointment. 11. In case of listed company, particulars of appointment of director should also be given to the stock exchange if the shares of the company are listed.